The Marcellus Shale gas field underlies portions of New York, Pennsylvania, Ohio, Virginia, Maryland, Tennessee, and West Virginia. Development of hydraulic fracturing and horizontal drilling technology led to extensive development of gas from the Marcellus Shale beginning about 2007. The need to identify and monitor changes in water-quality conditions related to development of the Marcellus Shale gas field prompted the U.S. Geological Survey, in cooperation with the West Virginia Department of Environmental Protection, Division of Water and Waste Management, to document water quality for comparison with water quality in samples collected at a future date. The identification of change in water-quality conditions over time is more difficult if baseline water-quality conditions have not been documented. 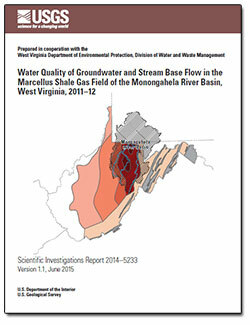 U.S. Geological Survey personnel sampled groundwater and surface water in West Virginia’s Monongahela River Basin during 2011–12. A groundwater survey, in which 39 wells and 2 springs were sampled, was conducted during June through September 2011. A base-flow survey was conducted during July through October 2012; 50 stream sites were sampled under base-flow conditions in this survey. Because additives to hydraulic fracturing fluids are variable and decrease in flowback water over a relatively short time, water-quality analyses for this study focused on documenting the water-quality characteristics typical of water from shallow aquifers; water derived from contact with the Marcellus Shale (flowback from hydraulic fracturing or formation water); and water with constituents from conventional oil and gas development, sewage effluent, and coal-mine drainage. All samples were analyzed for field properties (water temperature, pH, specific conductance, dissolved oxygen, and turbidity), major ions, trace elements, naturally occurring radioactive materials, and stable isotopes. In addition to documenting baseline water-quality conditions for an area of shale-gas development, these data were examined for patterns in water quality. Groundwater and base-flow survey data were compared to historical data from the Monongahela River Basin in West Virginia. Additionally, groundwater- and base-flow survey samples were grouped by Marcellus Shale gas production in the subbasin in which that sampling site was located. The comparisons of data collected as part of this study with historical data identified few differences. No significant difference was found in a comparison of groundwater survey data and historical data. Base-flow survey samples differed significantly from historical data for pH, chloride, and strontium, all of which had higher concentrations in the base-flow survey samples. Differences in pH are likely related to changes in mining regulation beginning in 1977. Concentrations of chloride and strontium elevated above background concentrations may be related to saline groundwater; saline water is within 300 feet of the land surface in parts of the study area. In the comparison of base-flow survey samples grouped by shale-gas-production setting, significant differences were found for fluoride and barium. Concentrations of fluoride and barium were higher in stream subbasins with active Marcellus Shale production than in subbasins not near active Marcellus Shale production. Elevated fluoride and barium are associated with deep brines. Generally, naturally occurring radioactive materials were not found in elevated concentrations in either groundwater or base-flow samples. Only 3 samples, 2 from the groundwater survey and one from the base-flow survey, exceeded the U.S. Environmental Protection Agency maximum contaminant level for radium isotopes of 5.0 picocurie per liter for either a single isotope or a combined value of radium-226 and radium-228. Stable isotope composition indicates broad similarity among surface water, shallow groundwater, and precipitation in the region. Neither shallow groundwater nor surface water showed a marked similarity with the deep brines associated with shale gas. In most of the groundwater survey samples, 38 of 41 samples, dissolved gas profiles were similar to those previously found in samples from shallow, domestic wells in the region. This study provides a baseline of water-quality conditions in the Monongahela River Basin in West Virginia during the early phases of development of the Marcellus Shale gas field. Although not all inclusive, the results of this study provide a set of reliable water-quality data against which future data sets can be compared and the effects of shale-gas development may be determined. Chambers, D.B., Kozar, M.D., Messinger, Terence, Mulder, M.L., Pelak, A.J., and White, J.S., 2015, Water quality of groundwater and stream base flow in the Marcellus Shale Gas Field of the Monongahela River Basin, West Virginia, 2011–12 (ver. 1.1, June 25, 2015): U.S. Geological Survey Scientific Investigations Report 2014–5233, 75 p., http://dx.doi.org/10.3133/sir20145233.